Organic goji berries benefits to the macula are the result of their high amounts of antioxidant compounds, including zeaxanthin. They may possibly be one of the best foods for your eyes and especially your macula - find out why. Goji berries are very nutrient dense berries rich in antioxidants and listed by some specialists as one of the top 10 "Superfoods." In the health-food industry, this berry is also known as the Chinese wolfberry. The berries grow on an evergreen shrub found in temperate and subtropical regions in China, Mongolia and in the Himalayas in Tibet. 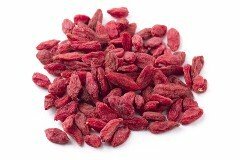 Rather than eaten as fresh fruit, you can purchase dried goji berries that look like small, red raisins. Its plant-based protein actually has 18 amino acids -- including all 8 essential amino acids – which is 10% of the fruits composition. Especially rich in carotenoids such as beta-carotene and zeaxanthin, these Chinese berries are commonly found in juices and teas or can be bought as a dried fruit. 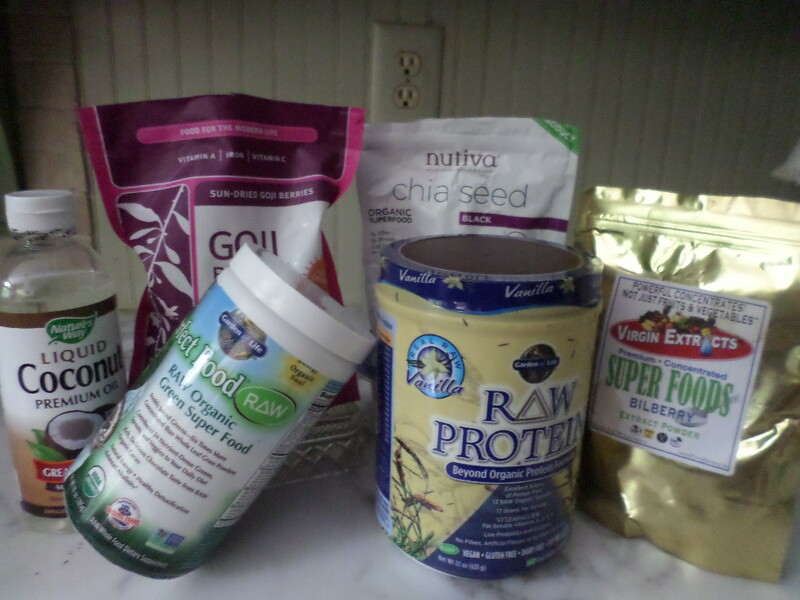 My husband and I have started including organic goji berries into our diet. Although many people do enjoy eating them plain or mixed with their granola, we like to put them in our healthy smoothies. Despite the berry's popularity, the scientific research on them is still in its infancy. "There is limited data on the wolfberry," said Mark Failla, chairman of the Human Nutrition Department at Ohio State University, who is studying the berry. Based on early research, Failla says,"... it's clear that they contain extremely high levels of zeaxanthin, a carotenoid related to beta carotene." P.S. It is important to note that these berries may interact with anticoagulant drugs (commonly called "blood-thinners"), such as warfarin (Coumadin®). David Wolfe, the author of Superfoods: The Food and Medicine of the Future, Lists the goji berry as one of the top 10 Superfoods. and goes on to say "Goji berries are perhaps the most nutritionally rich berry-fruit on the planet." Actually, there is good reason for this for this label. According to his book, David Wolfe tells us that "they are a complete protein source and contain 19 different amino acids. Goji berries can contain 21 or more trace minerals as well as vitamins B1, B2, B6, and vitmin E."
A plant-based protein that includes all 8 essential amino acids is quite rare. 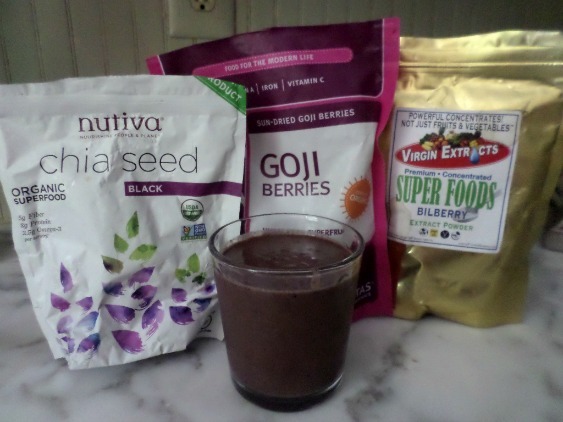 The goji wolfberry has had quite a buzz lately - claiming all kinds of health benefits. While all of the claims may not be well researched, this fruit does have some powerful antioxidants that can support healthy vision. Goji berries benefits to the macula are the result of their high antioxidant compounds, including zeaxanthin. According to David Wolfe, author of Superfoods: The Food and Medicine of the Future, "goji berries typically contain 2 to 4 times the amount of antioxidants found in blueberries." Why do we care about zeaxanthin and lutein? Zeaxanthin, along with lutein, make up the macular pigment, which protects our eyes from the harmful effects of the sun. While lutein is concentrated mostly in the rod cells of your retina, the cone cells, which are responsible for sharp, detailed central vision, have a high concentration of zeaxanthin. These two powerful antioxidants protect the retina by neutralizing free radicals thus preventing the damage that they cause. Low levels of macular pigment are often found in eyes with age related macular degeneration (AMD) and in those with risk factors for AMD. As part of our quest to prevent the development of macular degeneration we are adding foods that will help build our macular pigment. The berries taste great in a smoothie, eaten plain or added to your morning oatmeal. 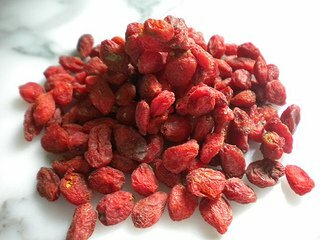 You can buy dried goji berries on line from several sources. The two most reputable brands are Sunfood and Navitas. However, you can get a 16 oz bag of berries from Navitas for almost the same price as an 8 oz bag from Sunfood. If you belong to Amazon Prime you can get free shipping. The content of these nutrients do depend on the maturity of the plant at harvesting, growing and soil conditions, geographic region, processing and length of storage. It is no surprise that goji berries benefits our health and our eyes in many ways with antioxidants like lutein, zeaxanthin and lycopene. After becoming aware of all the rich nutrients in these little dried berries, we have become more consistent in including them in our diet and reaping it's many benefits. We put them in our smoothies and our cereal and regularly drink goji berry juice. Organic goji berry juice is a quick and easy way to get some great antioxidants, especially zeaxanthin which benefits our macula. 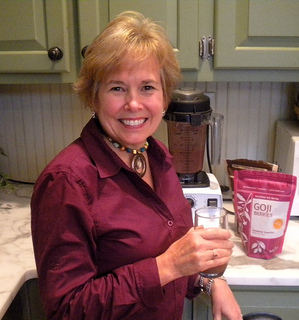 My husband and I have replaced our daily morning orange juice with goji berry juice. It is the easiest way for us to reap the benefits of this berry. 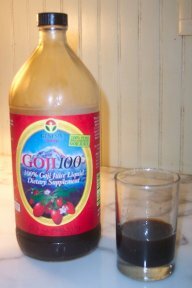 To get the full benefit of the goji wolfberry be sure to buy juice that has no added sweeteners, water or other juices. It tastes good and you only need a small glass of it each day. The recommended serving size is just one ounce. Once you open the bottle, try to finish it in 30 days. We buy the Genesis brand. I have tried other brands but have always been disappointed and go back to Genesis. I like the fact that it is pure juice - with no additives, sweeteners, water or other juices. The instructions say to drink it on an empty stomach - so this is the first thing we do in the morning when we get to the kitchen. Shake it well before serving it. As with any fruit, vegetable or food that has great health benefits, the important thing to remember is that your body needs variety. No one food can meet all of our nutritional needs. That said, when we do eat, let's eat foods that are going to bring the greatest benefit to our bodies and in this case to our eyes. It is important to note that these berries may interact with anticoagulant drugs (commonly called "blood-thinners"), such as warfarin (Coumadin®) so check with your doctor first. Although there are alot of claims as to goji berries benefits that may be hard to verify, one thing is sure - they are full of great nutrition including vitamins, minerals, protein, carbohydrates, fat and antioxidants.